Hello everyone! This is sort of a rush as I want to have this entered on ODBDSLC47. This is my 2nd entry so I hope it gets in on time. I was about to adhere the pot using my glue but then decided to use pop dots instead for added dimension. 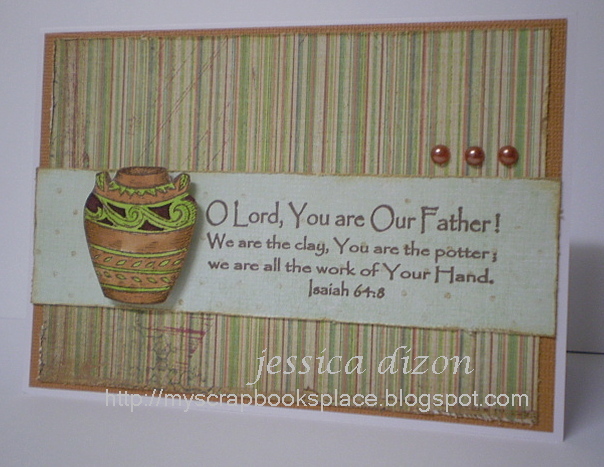 This card took me less than 20mins to make as I was really, really rushing! Thanks for the sketch challenge, it made my work easier!! :) I coloured the pot using Copic markers and the SU! Bravo Burgundy marker (for the top part). 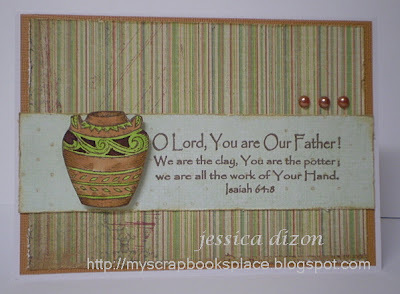 I used Heidi Swapp distressing tool and Tim Holtz Antique Linen to distress the edges of my card and the sentiment panel. The paper is from K&Company Charlotte paper pad. Thanks so much for looking and for your never-ending visits and support. Oh how pretty!! I just love your colors and teh design with the striped dp and the pottery! Thanks for joining the ODBD Shining the Light challenge.